If you’re diabetic, you’re well aware of the importance of keeping an eye on your blood sugar levels. If left unchecked, diabetics can suffer from either hyperglycemia or hypoglycemia. Both of these conditions can cause serious medical complications if left untreated. OneTouch offers a wide range of diabetic supplies such as blood sugar testing meters as well as test strips so that you can monitor your blood sugar levels. When you’re on the go, you don’t want to carry bulky blood sugar testing meters. That’s where The OneTouch UltraMini® Meter comes in. It is a small and compact alternative to regular sized meters. It’s quick and simple interface allows you to test your blood sugar without any hassle. The meter comes in three colors - Pink Glow®, Silver Moon®, and Blue Comet®. It also works with OneTouch Ultra® Test Strips and OneTouch Ultra® Control Solution (both of which need to be purchased separately). 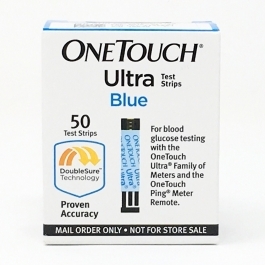 The OneTouch® Ultra® Test Strips with FastdrawTM Design Test Strips are made for use in blood sugar testing meters. They make the process of checking blood glucose levels easy, quick, and less painful. With just a small speck of blood from your fingers or forearm, you can get an accurate reading of your blood glucose levels. All you need to do is touch the end of the test strip with the speck of blood. The test strip then automatically draws up the blood in order for the OneTouch® Ultra® Meter to give you an accurate reading. OneTouch test strips come in packages with varying quantities. These include 25, 50, or 100 test strips. OneTouch offers a wide range of diabetic supplies. For instance, there are a number of different types of blood glucose testing meters to suit your particular needs. Speak to your healthcare provider if you are interested in using any OneTouch products. Use OneTouch Ultra Strips with OneTouch Ultra and OneTouch UltraSmart Brand Meters and InDuo Systems. 50 Test Strips - 2 Vials of 25 Test Strips. - Automatically draw blood into the test strip. - Glucose oxidase (greater than or equal to) 0.8IU. I am so glad to find these test at your site! The prices are wonderful! I will recommend this site to everyone!! Your "online only" pricing for this product is the lowest I've ever seen and it is the same quality as store bought. Will come back to you for re-orders! Thank you!!! Absolutely the lowest price on these online!! ...and with free shipping to boot! This is the best value you can find. Go for it. I searched the web to find the best price on these strips. yours was by far the best! Yours also included free shipping which many of the others charged for separately. I was very pleased with the service and the shipment. The only difficulty I had was that I had to order by phone, because your web site would not accept my order. Your rep said it was because your site did not work well with my browser. I have Explorer which is a very popular browser. Maybe you should consider updating your site to be better compatible with Explorer since it is a browser used by many people. Thank you for having such a great price! This is really amazing, especially for people who need to use these tests several times a day! Thank you. Best price for the money!!! And delivered to your door. Thanks for selling these online. We have a diabetic Golden Retiever that I test several times a day. We were buying from a chain drug store and paying over $105.00 for a box of 100. With a dog not having any type of health insurance coverage these were just too expensive to buy. Now with your online store it is alot less painless on the wallet. THANK YOU!!! Thanks for making these so affordable -- I don't hesitate to test any more! Being a diabetic is hard enough but not having health insurance is worst. Thank you for making these supplies more affordable. Price is great. Almost 1/2 of what I would pay at the retail level. Easy to acquire. Why can't everything be like this? I was so.... doubtful and afraid to order,thinking I might get con and cheated out of my money. I couldn't see how your site would be able to sell the test strips so low and be the exact kind from the drug stores. Walgreens 50 test strips $57.99 s/h $5.49, tax $4.28=$67.76 Boy, was I glad to see a online company that delivered the exact product ordered, and fast standard free shipping!! Thank You So Very Much!!! I am back to order more supplies! Thanks again! We have a diabetic black lab that is my wife's retired guide dog. We test at least twice a day and was getting very expensive. I an soooo glad to find your site. My vet now gets her strips from here also. Thanks HealthWarehouse. NO ONE WILL ARGUE THE PRICING OF THE SUPPLIES. MY REVIEW IS WITH THE COMPANY SERVICE. MY ORIGINAL ORDER CAME IN WHIT WRONG ITEMS AND 1 ITEM SHORT. THE FIRST ATTEMPT TO CORRECT FAILED BECAUSE OF USPS ERRORS. I CALLED A 2ND TIME AND THE ORDER WAS CORRECTED AND SHIPPED IN THE 2 DAYS THEY SAID IT WOULD BE. THE COMPANY WAS CURTIOUS AND FOLLOWED UP WITH PHONE CALLS TILL THE ORDER WAS CORRECTED. GREAT JOB IS MY REVIEW AND I WILL BE USING THEM AGAIN. I saved a lot of money by buying from you. I Also get box that has an extended expiration. Thank you. items ordered arrived in 2 days. excellent.